Spring has sprung and flowers are popping up everywhere, including my kitchen! 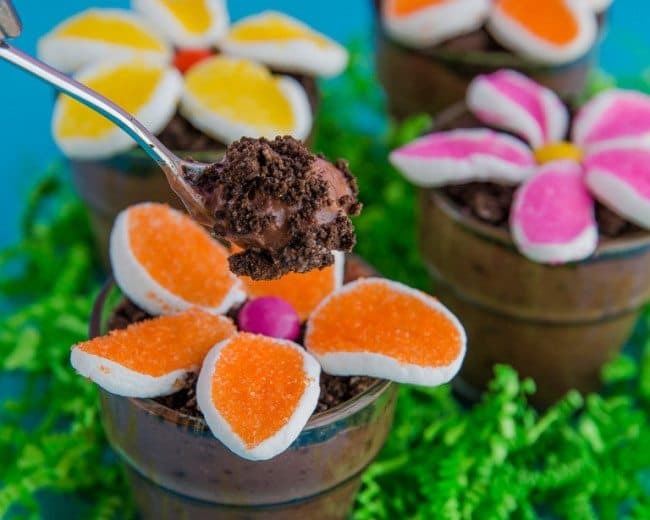 If you are looking for a fun and easy spring dessert that is just as adorable as it is delicious, then you will love these Easy Flower Pot Pudding Dirt Cups. 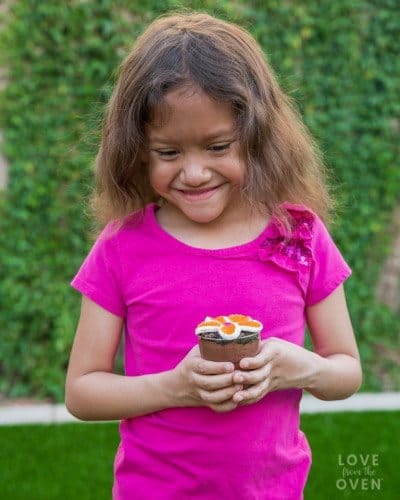 Not only will your kids love eating these, but they will love making them as well! 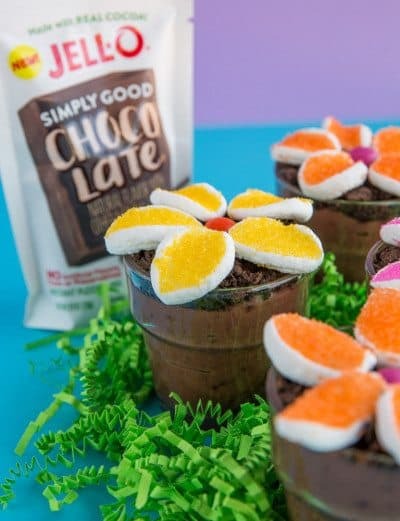 My youngest daughter loves to help in the kitchen, so when my friends at Jell-O asked if I would like to make and share this fun recipe for Easy Flower Pot Pudding Dirt Cups using their new JELL-O SIMPLY GOOD Pudding Mix, I was quick to say yes. Thank you to JELL-O for sponsoring this post. 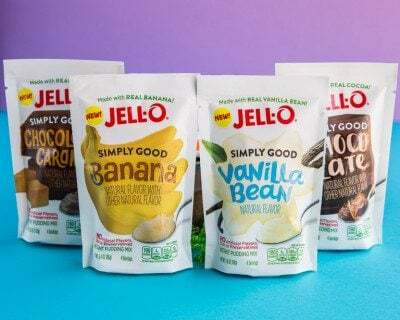 New JELL-O SIMPLY GOOD Gelatin and Pudding mixes contain NO artificial flavors, dyes or preservatives, something that this mom loves. They come in eight different flavors and can be found in the baking aisle next to Jell-O. With fun flavors such as Pineapple Orange and Chocolate Caramel, I’ll be working these into a variety of recipes in my home. 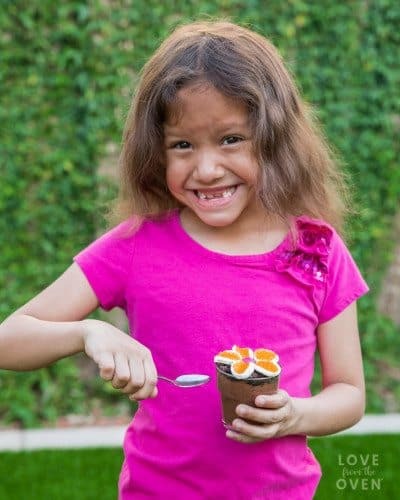 I love that these darling and easy flower pot dirt cup desserts come together in a matter of minutes and are so kid-friendly. If your kids are anything like my daughter, they love to help in the kitchen, but they also don’t always have the patience or attention for recipes that take a lot of time. These are fantastic because in as little as ten minutes they are ready to enjoy. My daughter loves scooping the pudding into the cups and topping them with cookie crumb “dirt”. 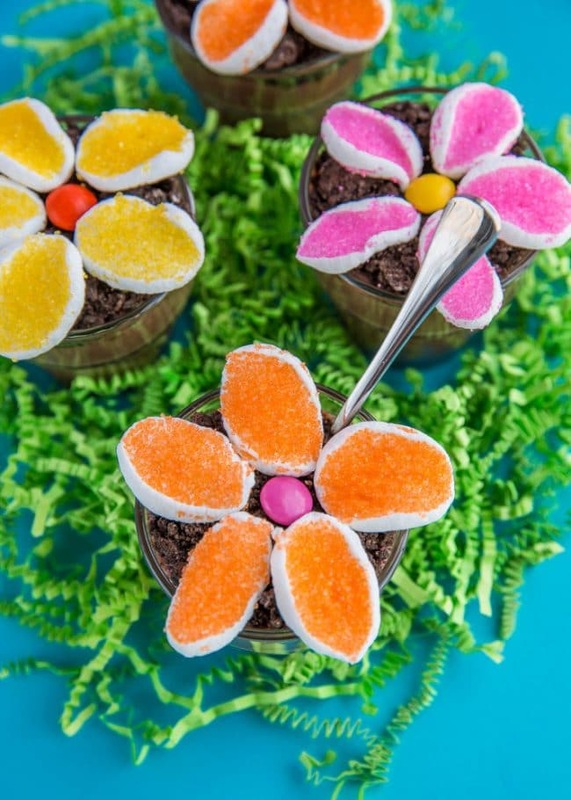 These sweet little dirt cups are perfect for spring and summer, and they are cute enough that they can do double duty as both a dessert and a table decoration. I think these would be lovely at a spring party, Easter gathering or summer barbecue. They would be absolutely perfect for a children’s tea party! 1 pkg. 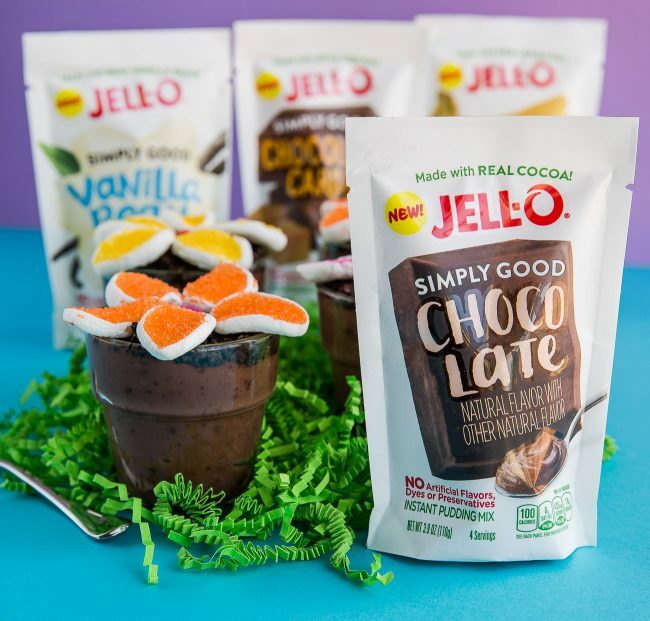 JELL-O SIMPLY GOOD Chocolate Flavor Instant Pudding 3.9 oz. Beat pudding mix and milk with whisk 2 min. ; spoon into 4 dessert cups. Let stand 5 min. Meanwhile, use kitchen shears to cut each marshmallow crosswise into 5 pieces. Dip cut sides of marshmallows, 1 at a time, into sugar. Top pudding with cookie crumbs. 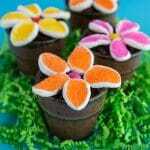 Arrange 5 marshmallow pieces on top of each pudding cup to resemble flower as shown in photo. Place 1 candy piece in center of each flower. 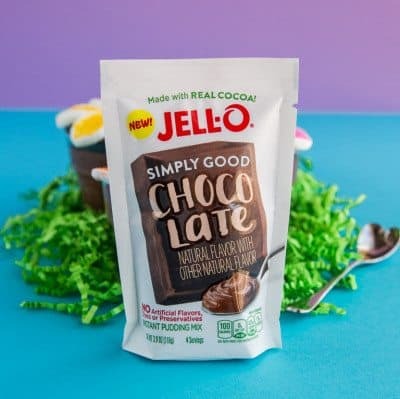 *Note: pudding will not set with non-dairy milk Substitute: Prepare using regular JELL-O Chocolate Flavor Instant Pudding. Recipe courtesy of Kraft Foods. I hope that your family enjoys these Easy Flower Pot Dirt Cups as much as mine does. You can check the Kraft Product Locator to find Jell-O Simply Good, as well as original Jell-O, at a store near you. Make sure to visit Checkout 51 for coupons. Disclosure: This post was sponsored by JELL-O /Kraft Heinz. All opinions however are mine and mine alone. Super cute idea! This is such a fun idea to try with kids. I’m sure my son would love it.